The Japanese name for fresh, edible soybeans, edamame [eh-dah-MAH-meh] are usually bright to dark green and available fresh in Asian markets from late spring to early fall. They’re also available frozen. The seeds of edamame varieties are rich in protein and highly nutritious. Worldwide, it is a minor crop, but it is quite popular in East Asia. Edamame is consumed mainly as a snack, but also as a vegetable, an addition to soups, or processed into sweets. Its use was first recorded around 200 B.C. as a medicinal and is still very popular. In Japan, edamame was grown on the bunds between rice paddies, but with the current rice surplus and official pressure to convert paddy fields to other uses, field production is more common. 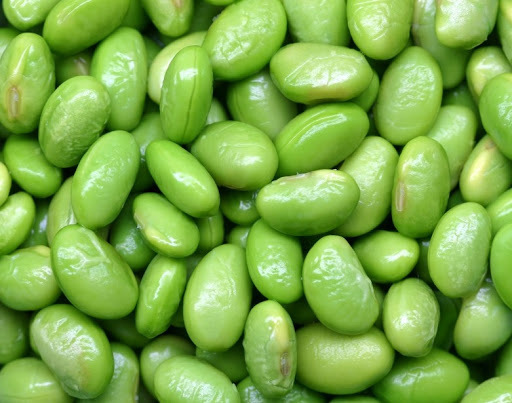 In the United States, edamame has potential as an easier-to-grow, better tasting, more nutritious substitute for lima beans. Served in the pods, it might appeal to consumers interested in natural foods, particularly if it were grown organically. Boil water in a large pan. Wash edamame beans well. Add beans to boiling water and boil for 5-10 minutes. Drain and sprinkle salt over beans to taste. Can be served warm or cool. Eat by pushing seeds directly from pods into the mouth, discard skin. This entry was posted in beans, Fresh Pick, vegetarian. Bookmark the permalink.